Primarily the application combines mobile phones and headphones along with location and activity data to reduce distraction for pedestrians and cyclists. 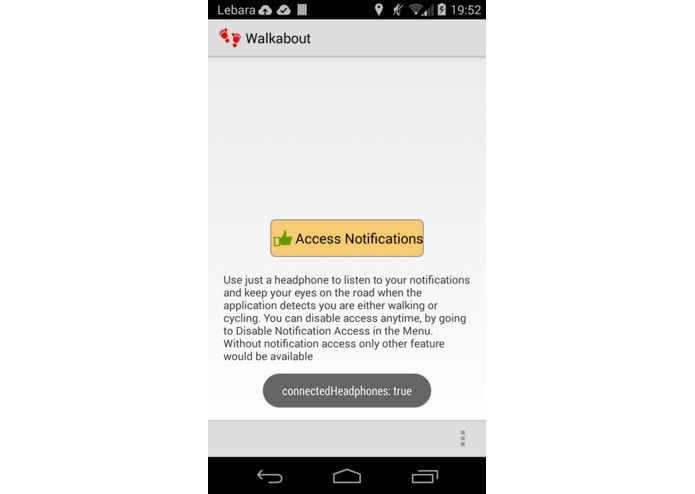 The application runs in the background and based on user activity(if detected walking and cycling), channels notifications through connected headphones. 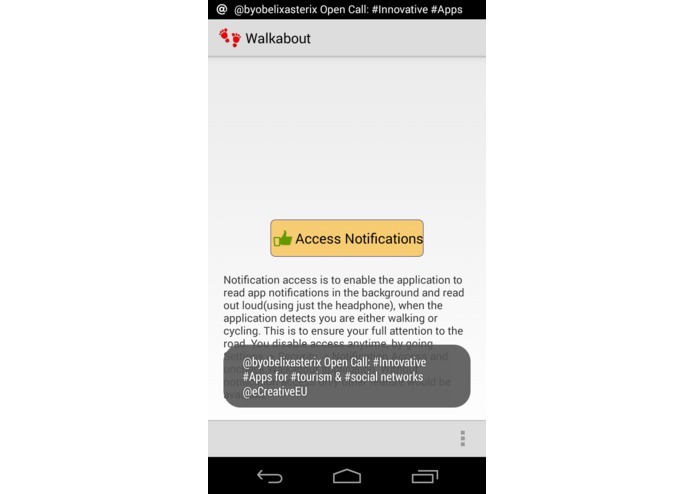 It uses the native android Text-To-Speech API to speak the notifications. The notifications read are only the snippets available in the notification bar. In future a respond functionality will be added. In the video, unfortunately could not record audio, of the notifications being read. The application will not work without access to location data. It has been tested on a Motorola Moto G.
It is available for devices with android OS 4.3+. This is since it uses efficient activity and location detection. Also, the notification listener is available only for devices 4.3 above. There is no need to have a separate wearable etc. Just headphones. If the user attempts to read the screen outside while walking or cycling, based on proximity data and gestures, it displays a safety message reminding of the danger. It also suggest nearest spots such as bus stops or cafe where the user can access their smartphones without any danger. The application uses geo-fencing, based on the traffic signal data. (Although does not store that yet)The geofencing data will be used when rewards are introduced for good mobile phone behaviour around traffic lights.